A powerful, highly fitting homage to real stories: Adam Bruce reviews Zodwa Nyoni’s punchy, poetic paean to Leeds life. Ode to Leeds, West Yorkshire Playhouse. Photo: Anthony Robling. Writer Zodwa Nyoni, who has steadily been carving herself a reputation as one of Yorkshire’s boldest new voices, is an alum of poetry slam group Leeds Young Authors. Her latest work, Ode to Leeds, is an amalgamation of her own experiences with the group, brought to life by new characters who find their voices in the fictional poetry group Metaphonetics. Leeds Young Authors made history when they were invited to compete in America’s famous Brave New Voices international poetry slam festival in 2004. Being the first non-American team to compete, and placing second in 2009, the group became internationally recognised as a powerhouse of performance talent. Ode to Leeds draws upon these stories in its portrait of modern Leeds life. Spread across different age groups and backgrounds, its five characters – played by Chance Perdomo, Aryana Ramkhalawon, Archie Rush, Genesis Lynea and Leah Walker – must navigate a challenging world where their art becomes their escape. Handling this narrative is director James Brining, who has carefully crafted a world that properly emphasises the rich language of Nyoni’s play. Ode to Leeds is constructed of a distinct fusion of spoken word, poetry, music and beatboxing. The talented young cast nail this, for the most part, and help to create a fitting homage to one of the city’s most prominent cultural entities. Nyoni’s text is composed of scenes that primarily deal in narrative exposition, but do not emphasise character development. As a result of this, it’s sometimes difficult to connect with the characters. The general pace of the piece is speedy and efficient, and Brining adopts a filmic transition style, whisking us between multiple locations quickly, which can sometimes take away from some of the narrative’s more sensitive moments. 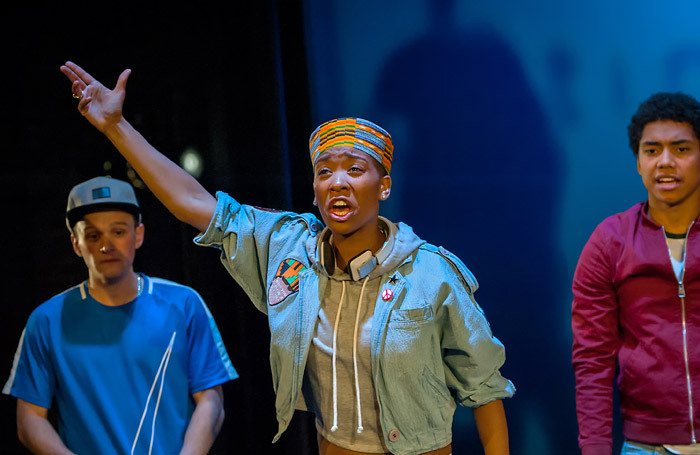 While I felt that the story’s finer details were sometimes blurred by the play’s fast pace, there is a harmonious spirit between the ensemble, which reaches out to connect with the audience and navigate its way through Nyoni’s textually rich landscape. Designer Lucy Sierra opts for a minimalistic set which works perfectly with Katharine Williams’ lighting design, emphasising the piece’s filmic style and firmly putting the focus on the performers. The most striking scenographic aspect, however, has to be Simon Wainwright’s video design, which carefully interweaves map pin drops, images of Leeds, and live camera projection. Sound designer Harry Blake rounds everything off with a contemporary musical palette consisting of sounds and beats from the likes of Ed Sheeran and Aloe Blacc, demonstrating the prominence of popular rap and spoken word, along with its significance for members of the play’s poetry slam group. In all, Ode to Leeds is a powerful, highly fitting homage to the real stories it draws upon, and an enjoyable, character-driven evening. Ode to Leeds is at the West Yorkshire Playhouse until July 1st. For more details, click here.